1. Love gives life purpose and meaning. The world is looking for love, but they are really looking for God, because God is love. 2. When you walk in love it’s impossible for people to really find anything wrong with you. They may try for a period of time, but true love will melt the coldest, hardest heart. 3. Love is manifested in how we treat people, not how they treat us. 4. Don’t give up on the people you love! Your patient love and faithfulness may be exactly what they need to make a complete turnaround. 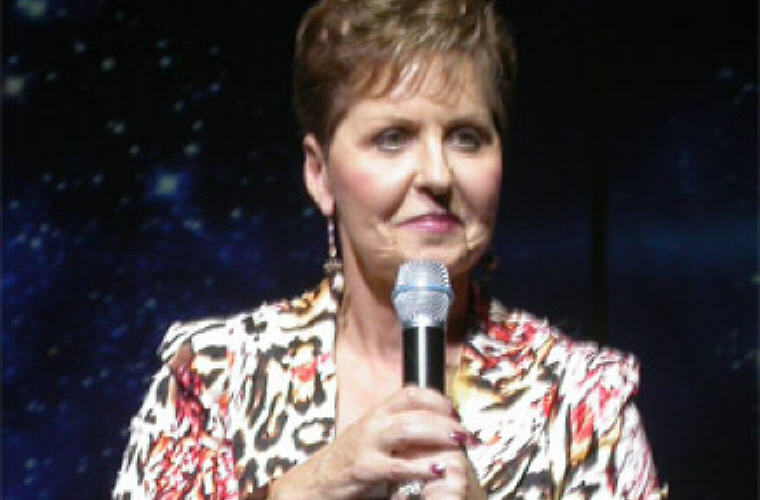 Excerpt from Wikipedia: Joyce Meyer (born Pauline Joyce Hutchison; June 4, 1943) is a Charismatic Christian author and speaker. Meyer and her husband Dave have four grown children, and live outside St. Louis, Missouri. Her ministry is headquartered in the St. Louis suburb of Fenton, Missouri. 1. When you forgive, you must cancel the debt. Don’t spend your life paying and collecting debts. 2. Nobody can be set free from a problem until they’re willing to admit they have one. 3. We may not be able to change every circumstance in our life, but we can change our outlook. 4. Patience is not only the ability to wait, but also the ability to keep a good attitude while waiting. 5. Courage is not the absence of fear; it is fear that has said its prayers and decided to go forward anyway. 6. Whatever unexpected challenge or frustration you may face, decide in advance that you’re not going to let it steal your joy. 7. When you are tempted to doubt, tempted to give up, tempted to call it quits, choose to believe instead. 8. Our joy does not have to be based on our circumstances. 9. You can not live your life just based on what everyone else thinks. 10. Happiness is not a feeling, it is a choice. To be happy, one must choose to be happy, not respond to a circumstance that now controls your happiness. 11. One mistake does not have to rule a person’s entire life. 12. Strive for excellence, not perfection, because we don’t live in a perfect world. 13. 80% of people’s problems are about how they feel about themselves. 14. We need a backbone, not a wishbone. 15. It is not as important how we start (our past), but how we finish. 16. Try a thing you haven’t done three times. Once to get over the fear of doing it. Twice to learn how to do it. And a third time to figure out whether you like it or not. 17. Focus on giving smiles away and you will always discover that your own smiles will always be in great supply! 18. Is there any real purpose in being alive if all we are going to do is get up every day and live only for ourselves? Live your life to help others. Give & live selflessly. 19. Wisdom is doing now what you are going to be happy with later on. 20. Excellence – Take what you have and do the BEST with it. 21. There are no drive-thru breakthroughs. Breakthroughs take time. 22. You can be pitiful, or you can be powerful, but you can’t be both. 23. Do yourself a favor and forgive anyone that has anything against you. Do it as an act of faith and trust God to change and heal your emotions. Pray for your enemies and never say another unkind thing about them. It is the only way you can move past the pain and begin to heal. 24. You cannot have a positive life and a negative mind. 25. Faithfulness is not doing something right once but doing something right over and over and over and over. 26. Do what you don’t want to do to get what you want to get. 27. Trust and faith bring joy to life and help relationships grow to their maximum potential. 28. If you’re fighting moodiness and depression you don’t want to hang around a bunch of other moody and depressed people. 29. There are two kinds of pain: the pain of change and the pain of never changing and remaining the same. 30. Where the mind goes the man follows. 31. When someone gives you offense, it doesn’t mean you have to take it. 32. If you are facing a new challenge or being asked to do something that you have never done before don’t be afraid to step out. You have more capability than you think you do but you will never see it unless you place a demand on yourself for more. 33. Better to have a big goal and reach half of it than to have no goal and reach all of it. 34. If you are facing a difficult task don’t put it off. If you do it will just keep tormenting you. 35. I learned that what happened to me did not have to define who I was. My past could not control my future unless I allowed it to. 36. Sometime we get so addicted to murmuring about the past and blaming the past for everything that we miss our whole future. You’re not going to enjoy your future, and you’re not going to enjoy your right now, if all you can do is be guilty and ashamed and afraid of your past. 37. When we are overly concerned with what people think we will be controlled by the thoughts and opinions of other people. 38. I may not be where I need to be but at least I am not where I used to be. 39. Don’t be afraid of change because it’s leading you to a new beginning. 40. A positive attitude enables you to make the best of every situation, and that gives you power over your circumstances instead of allowing your circumstances to have power over you. 41. Stop comparing yourself to other people; you are an original. We are all different and it’s okay. 42. Teachers can change lives with just the right mix of chalk and challenges. 43. A grateful attitude makes you happy. 44. You’re going to be happy when you decide to be happy, not when you wait to feel like it. 45. If you are going to live a joyful, victorious life, you have to do so by choice and not by feeling. 46. Don’t ever waste a day. Once time goes by, you never get it back. 47. Since you are going to be with yourself all day today anyway, you may as well enjoy yourself! 48. When we fill our thoughts with right things, the wrong ones have no room to enter. 49. Sometimes a single word can make all the difference. 50. We don’t grow when things are easy, we grow when we face challenges. 51. Dreading something that isn’t here yet only wastes the time you have today. 52. It’s not the way we act in church that makes a difference. It’s about what goes on behind closed doors. 53. Expect something good to happen to you today! 54. Where the mind goes, the man follows. It’s impossible to have a positive life and at the same time, have a negative mind. 55. We’ve all got a past, but you can’t let the sorrows of your past determine your future. 56. Anytime we try and fail, we learn something that can benefit us in the future if we won’t give up. 57. Think beautiful thoughts and there will be no room for the ugly ones. 58. If it is cloudy and storming in your life today, look forward to the sun that will probably be shining tomorrow or the next day or the one after that. It won’t storm forever! 59. Whoever you are, wherever you are, whatever you’ve been through, it’s never too late to begin again. 60. When you are in a storm, remember that the rough weather won’t last forever! 61. A good attitude doesn’t come from having the best of everything in life; it comes from making the best of everything in life! 62. Don’t let the way other people treat you determine your worth and value. 63. Courage means to keep making forward progress while you still feel afraid. 64. You are the light of the world. All you have to do is flip your switch! 65. I am not going to let my emotions manage me, I am going to manage them. 66. It is way too big for one person to do everything, but we can all do something, and together we can change the world. 67. No matter what is going on in your life right now don’t lose hope. Your breakthrough is coming! 68. Small beginnings are the launching pad to great endings. 69. We all face challenges from time to time, but we can make them better or worse by the way we talk about them. 70. Remain calm in every situation because peace equals power. 71. Don’t be afraid to step out, have dreams, have visions, have hopes and always, always, always believe in miracles. 72. Any day that we don’t give up puts us one day closer to success! 73. You cannot give someone else the responsibility for your joy. Being happy is a choice you must make! 74. Unforgiveness is like a poison and a bitterness in your soul, and your life will always be bitter until you get rid of that poison. 75. Say something kind and encouraging to everyone you meet, and people will always be happy to see you coming. 1. You can suffer the pain of change or suffer remaining the way you are. 2. When you are tempted to give up, your breakthrough is probably just around the corner. 3. Character is doing what you don’t want to do but know you should do. 4. Deciding to think positively in a negative situation is one of the best things you can ever do for yourself. 5. Don’t spend your life waiting to be happy, decide to be happy now! 6. I’m never a failure, unless I quit trying, and neither are you. 7. When you feel down, go be a blessing to somebody else. 8. Our thoughts create the mold for our actions. 1. The Confident Woman: Live with Purpose and Fulfil Your Potential.